Our flatdeck trailers are manufactured to suit individual client requirements. With a flatdeck the wheels are under the deck to give you easy access to the deck area. This is good for loading timber, pallets or fruit bins, etc on with forklifts, loading and unloading by hand without bending your back over mudguards, or transporting machines that have a wide wheel track. 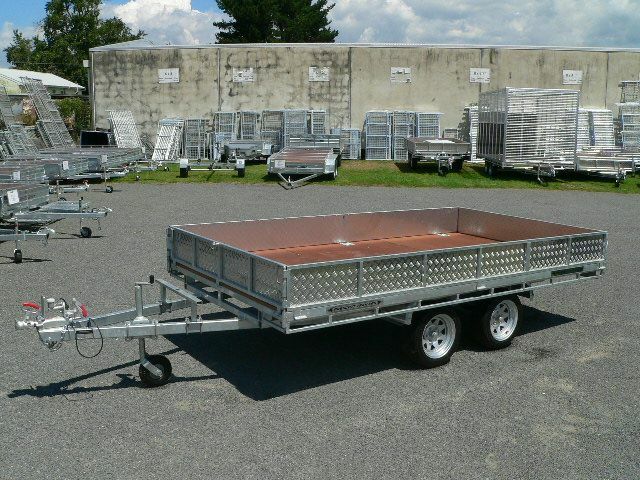 They are constructed with NZ made RHS steel, which is fully welded and galvanised, H3 treated plywood deck as standard (other deck materials can be used upon request), and regulation multi-volt LED lights. Sides and rear are dropdown and removable, and front can either be fixed, drop in or also fold down giving even more deck area. Flatdecks have a full length tie rail below the deck for securing your loads, and can also have flush mount tie rings mounted in deck area to tie down those smaller items. With a variety of wheel options the deck height can be put at a height that suits your industry requirements. Tandem axle flatdecks are fitted with oscillating suspension to give you a smoother ride over undulating road surfaces, and can be brake compatible for retro fitting later or have brakes fitted to suit your requirements at time of order.